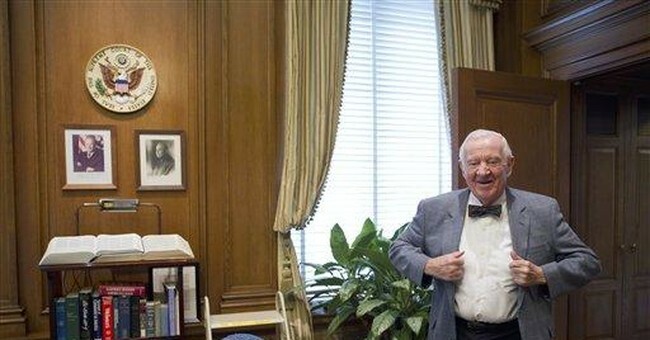 Former Supreme Court Justice John Paul Stevens plans to release his book, "The Making of a Justice: My First 94 Years,” in May, not long after his 99th birthday. The New York Times interviewed him for a piece about his memoir, at which point he laid out the three Supreme Court decisions he still believes, to this day, were the wrong decision. The 2008 landmark decision, often referred to as Heller, was a 5-4 decision that upheld an individual's right to possess a firearm for self-defense. There is no need to be part of a militia in order to own a gun. The Court also ruled that Washington, D.C.'s handgun ban and lock requirements were unconstitutional and directly violated the Second Amendment. The District had previously required residents who had firearms in the home to keep them disassembled or bound with a trigger lock when stored, something the Court believed when against the entire purpose of having a firearm: for self-defense. Stevens was one of the four dissenters. He was the one who actually wrote the dissenting opinion, arguing that firearm ownership had to be connected to militia service. He reflected back on the decision saying, "The combination of its actual practical impact by increasing the use of guns in the country and also the legal reasoning, which I thought was totally unpersuasive, persuaded me that the case is just about as bad as any in my tenure." According to Stevens, he did everything in this power to try to persuade others in the majority to understand his point-of-view, in hopes of getting them to switch their vote. He knew that it was likely that the others on the Court would side with gun owners so he sent around a draft of what would become his dissenting opinion five weeks before Justice Scalia drafted the majority opinion. Although Stevens' efforts failed, he was successful in getting Justice Anthony Kennedy to have Scalia make "important changes" to part of the majority opinion. The 2010 decision held that political spending is a protected form of speech under the First Amendment. Unions and corporations are allowed to influence voter opinions by supporting or opposing specific candidates, although they're not allowed to give directly to a political campaign. This was another 5-4 case. “Money in politics — it’s hard to believe the extent of it,” Stevens said about the case. “It was really a disgrace,” he told The Times.